Size/shape: 11mm long teardrops with 3 facets or "windows". The hole runs through the length. 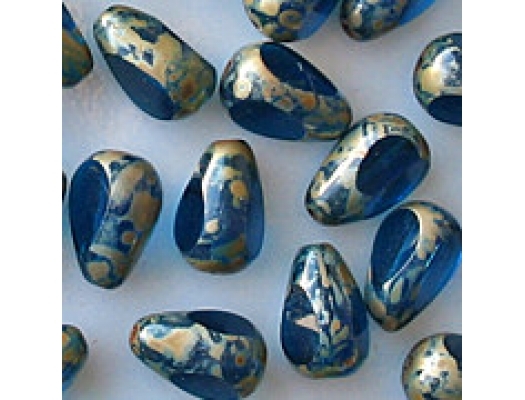 Colors/description: Translucent dark aqua with a brownish-silver coating on the non-faceted areas of the beads. Defects: These beads are fire-polished, which means that many of the facets are imperfect. Some facets are not smooth, but instead have a mottled texture. To read about the fire-polishing process, click here. 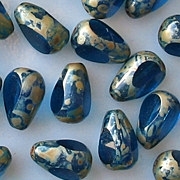 Comments: Until recently, I was calling these beads "dark aqua", but then I decided that they are actually capri blue. 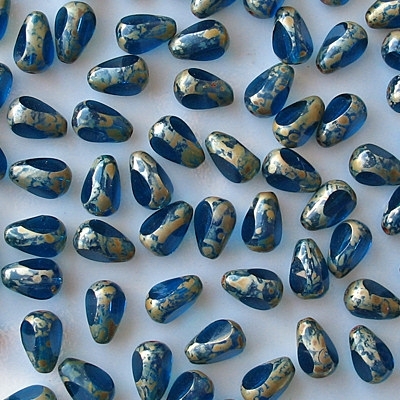 The brownish-silver picasso coating on these beads is very interesting. I just wish the facets were more perfect. Some facets look textured, as if they were matte instead of smooth.